We want to be a part of your special plans. Whether you require a table at a specific time, need us to cater your next event or just want to enjoy a meal from the comfort of home, we’ve thought of every detail to give you a memorable dining experience. With sushi and martini specials year round, we have the perfect scenario for you. Order Sky Bar Gift Cards Online! 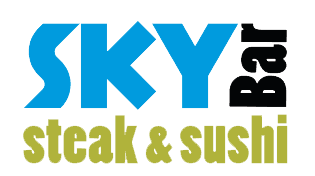 Sky Bar Steak & Sushi Gift Cards make the perfect gift, right in time for the Holidays! Order conveniently and securely online for employees, students, friends or that special someone. Sky Bar Steak & Sushi can cater any size event at any location with amazing sushi trays, delicious appetizers and more! Contact our catering and banquet manager Jan Inlow at 409.621.4759 for details and information. Whether you’re planning a special evening, having a large party or want to be seated without a wait, please call for reservations at 409.621.4SKY. We are happy to accommodate you and your party.